Dumbing of Age - Galasso’s Pizza (and subs) t-shirt! Galasso’s Pizza (and subs) t-shirt! 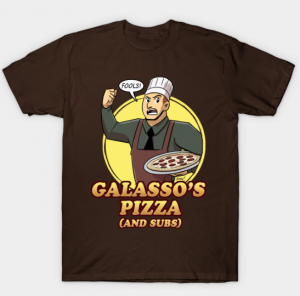 Display your fealty to Galasso’s Pizza (and subs) by wearing this dominating new t-shirt! It’s 30% off for the first three days, so stategically position yourself for savings! Only great FOOOOOOLS would spend money on such a shirt!! I also had a mighty need! But, sadly, I has no monies!